Each spring, the ice leaves early on a small area of Lake Bennett near its outlet, and Trumpeter and Tundra swans congregate there to rest, feed and socialize on their annual migration north. 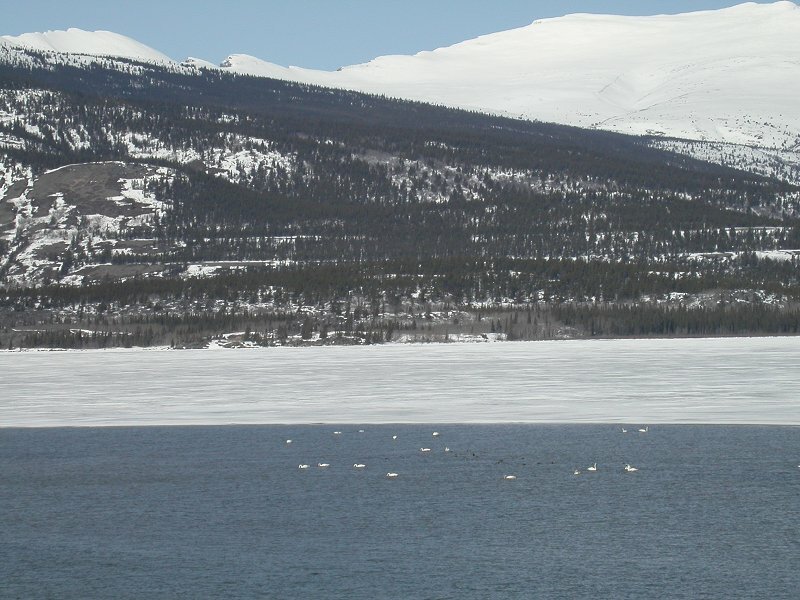 Though the numbers are not as large as at Marsh Lake, further down the Yukon River system, it is not unusual to see over 60 swans at a time, along with 100 or more ducks of several species. This photo was taken from my sundeck on April 10, 2004. See The Spiritual Swan for more information. This photograph is © 2004-2015 by Murray Lundberg, and is not to be copied without express permission.